I love the image of those tangled-up noodles, all mixed-up and crossing over multiple others with no defined starting place. It rather elegantly describes how ideas get bumped up against other ideas and begin to connect, overlap, and tangle until it's impossible to sort out where one story ends and another begins. This is a perfect image for this past weekend, when my ideas about our past inquiries got jostled (as I reviewed documentation) and tangled up with the reading I had been doing, and the patterns of thought that became illuminated throughout the week through play. One such "noodle" running through my mind was the idea of beauty: What is beauty? What does it mean to enjoy something beautiful? Is beauty important to play? Is beauty important to learning? Are there shared ideas of beauty across the diversity of human cultures and across age groups? Do our notions of beauty change as we grow and learn? On the last day of the break, I helped out at our local beach "spring clean-up". We filled many bags with recyclable materials and litter, much of it unrecognizable in its broken and wave-washed state. Most days at the beach I avoid the refuse unless it's dangerous like fishing line, nails or wire, which I always remove when I find it. I prefer to gather the beach glass and pottery shards which are softened by the waves. Sunday, however, was a fantastic day for finding bones: skulls, vertebrae, and parts unknown. I was utterly thrilled to find such beautiful specimens. My partner, Pooneh, appreciated the find but prefers to look at them from afar, much like the snakes we find in the no-mow zone which I adore. I realize my concept of beautiful includes things that many people find uninteresting or even abhorrent. Thinking about this makes me wonder about what others may find beautiful that may elude me. This tangle leads me to wonder about the meaning of feeling or identifying anything as beautiful, if it is a way of giving meaning to what we begin to understand in the world. Something so subjective, what could it mean to how we learn to read, write, and make sense of the mathematical patterns around us? And if we approach our practice as teacher-researchers, making meaning alongside our students, will our own concept of beauty expand as we learn to love what fascinates our students? Exploring materials is an evocative experience. It stimulates the imagination, inspires storytelling and interactions between children, and serves as a bridge to drawing, collage, sculpture, and construction. I am drawn to this idea of a beautiful space to work or play in, and yet I don't think that's what we have going on in our classroom. It is not necessarily pretty, with matching bins or boxes or items carefully displayed to highlight the visual quality. 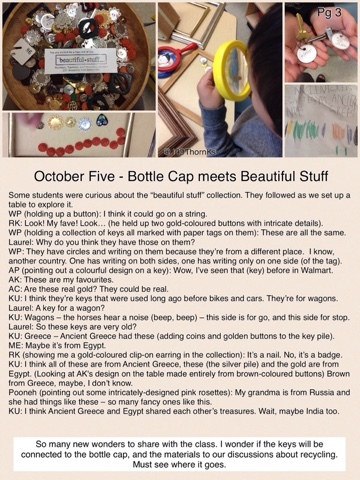 I have visited classrooms that stop me in my tracks - so attractive is the documentation, the inviting materials in an array of jars, or colours thoughtfully curated. I do appreciate this attention to detail, but I am not particularly adept at it. No, in our room we have materials in motion - the play defines what is available (thus on display) and where various parts will go when we tidy. Some areas go unloved a while before we notice them and question what new thing should happen there. Other areas become multi-use and jumbled, which isn't surprising in a class with quite high turnover (families move in and out over the year - we have four new students since the beginning of January) and nearly 30 students. It is, however, a place wherein beautiful things can happen: loose parts come together to become shadow-patterns on the wall, ramps, mazes and balance structures built by one or two students evolve into spontaneous large-group games with rules created on the fly, and plans are drawn up, materials negotiated, and experiments conducted with or without adult help or intervention. 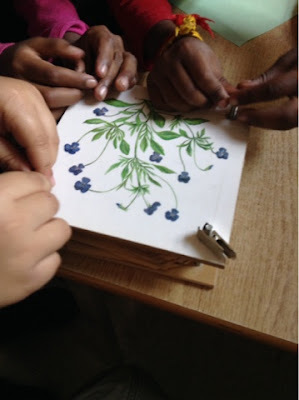 Students following their own notions of what is important to learn, and co-creating the conditions through play in order to learn them - that is beautiful, to me. My own experience with feeling like a bit of an oddball for what I find beautiful (what fascinates and draws my attention) helps me to remember the importance of learning what each one of our students finds appealing, interesting, boring, and frightening. It takes time to win over the most squeamish of students, those who find insects, spiders and other small creatures frightening. Modelling fascination and appreciation for tiny life forms eventually results in some understanding, if not outright interest in them. Finding value in both mess and order is another concept that takes time to develop through play. Another big idea naturally flows from the concepts of beauty, of order and chaos, and of our role in learning: life and what it means to be alive. I believe it's this idea that makes me so attracted to things like bones, fossils, fallen leaves, shed antlers, and other evidence of life's passing. So this weekend when I read the latest "teaching on the verge" post about educators recognizing their students' interests as they emerge, I realized that it was a big part of what I had been pondering, simply described in different language. Are we able to see what is interesting from another point of view? Do we see the wonder in what they see? I suppose I thought if I listened well the common thread would appear, or new directions would make themselves visible to me. I wonder if I was just reminding myself not to rush into a project, but to continue to play, and discuss with the group, and listen for resonance in the play. There were so many separate explorations going on at the time, including the volcano project, inquiry into building tall structures, our adopted tree, and life in the long grass of the no-mow zone. I do remember wondering if conversations alone would lead to meaning-making, because so few students were exploring the materials outside of large group meeting times. Now, looking back, I think I worried about how to extend the thinking, to make the philosophical questions explored into ideas we could tackle in day-to-day play. I don't recall exactly what I had in mind but it may come back to me so I leave it in - another noodle tangled up in with the rest. 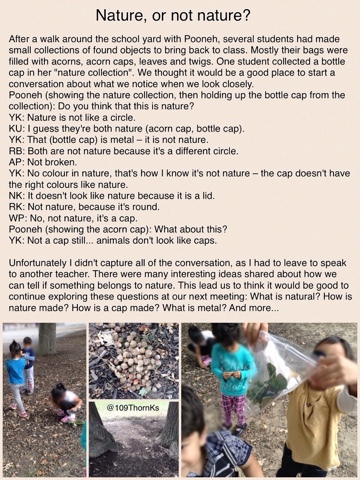 Here, then, is the story of how a single bottle cap found outside lead to some pretty big thinking. Back in the fall I saw a pattern emerging from several small themes being explored by students in our class. 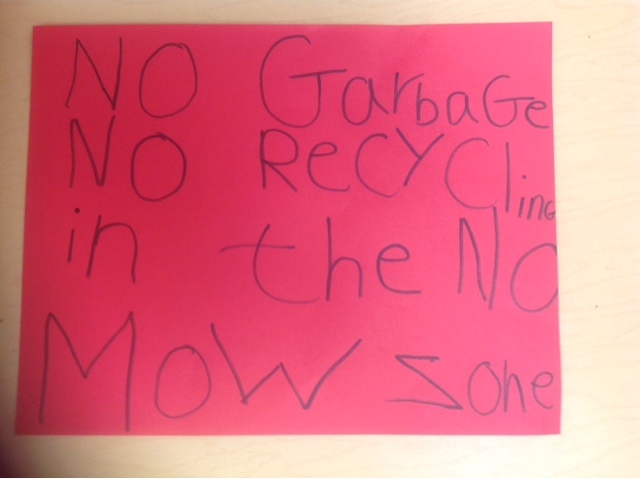 It began early in September when we were spending much of our days outside, often in the no-mow zone or taking walks around the schoolyard. When I realized that much of the notes and photos I'd been taking were coming into focus, I decided to gather glimpses to share with our families, to further the conversation outside of the classroom. 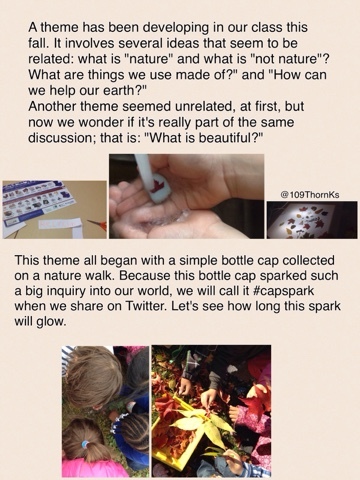 The collage below was the first I shared using the newly created #capspark hashtag. A few interests have been colliding into one big inquiry into the world around us. That our students would stop and observe something so small was not unusual - indeed, looking closely is a big part of our class culture for several years now, with senior students teaching their new junior classmates the skills and attitudes of young scientists exploring their world. 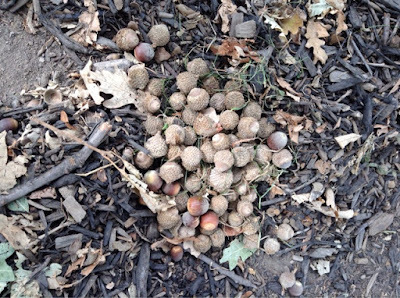 Pooneh brought these intriguing green and brown balls (walnuts) that had fallen from her tree at home. We looked closely at them during our morning meeting, then moved them to the "look closely" centre by the window. 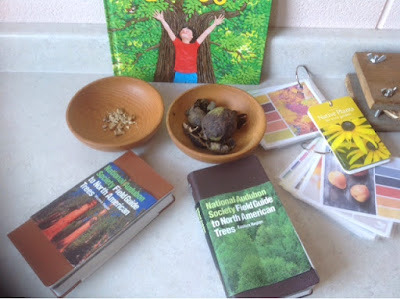 Here students explored the nuts, looked them up in the tree guides and other resources, and observed as they changed over time in the open air. Part of looking closely involves observational drawings. These often hang over the item being observed so we can watch for changes and compare notes using the drawings (for example, our current garden centre under the window). Here are drawings of the walnuts and an acorn cap. These students are opening up the leaf press to see what treasures I've pressed inside. Usually they would have collected and pressed their natural items themselves, but this press had just come out of my bag from home, and as such had a nice variety of late summer finds: wildflowers like Queen Anne's lace, vetch, wild morning glory, various maple leaves and seeds. 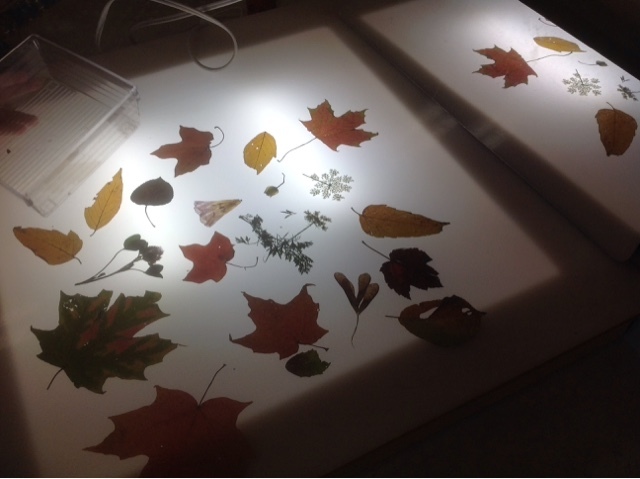 The colours of the pressed leaves and flowers were intriguing, so we turned on the light table and spread them out to look closely at their delicate details. 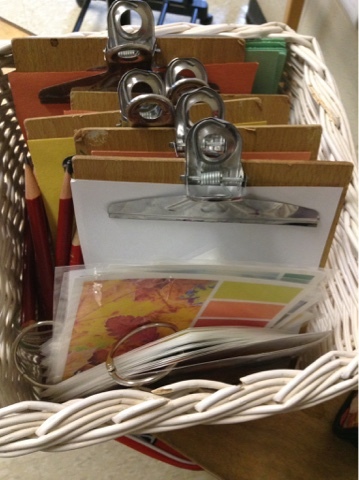 In September and October this basket was often lugged outside in the wonder wagon (along with magnifying glass, bags for collecting items, a little first-aid kit, and assorted tools) so that students could draw or take notes outside. This day it included the rings of colour-swatch cards and an invitation to find matching colours. We wondered about this bounty we found, mid-September - who gathered so many acorns and left them here? Was it "the big kids" at recess? Was it squirrels? Do birds eat these too? 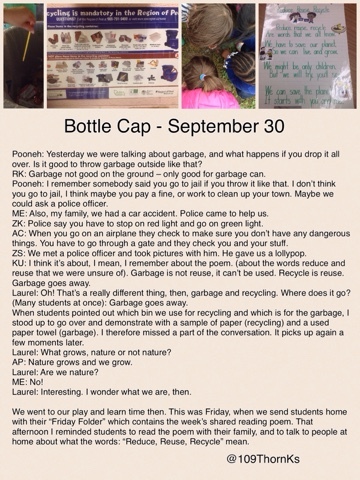 Our bottle cap story began in September, when we were all still learning about each other and discovering the boundaries of our wonderfully green school yard. In order for our newest students to gain a sense of what our school grounds have, and how we interact with nature (hint: gently and with great respect for living things), we go for many walks together before we break off into groups to follow our different interests. Below was one such day, shared here as a collage for our class twitter page. Later this day or perhaps the next day, Pooneh took a smaller group to the far side of the school where the "tall trees" are (the oaks) while some of us remained in the kindergarten yard with bikes and ball games. Her group brought bags so that each student could make their own collection. 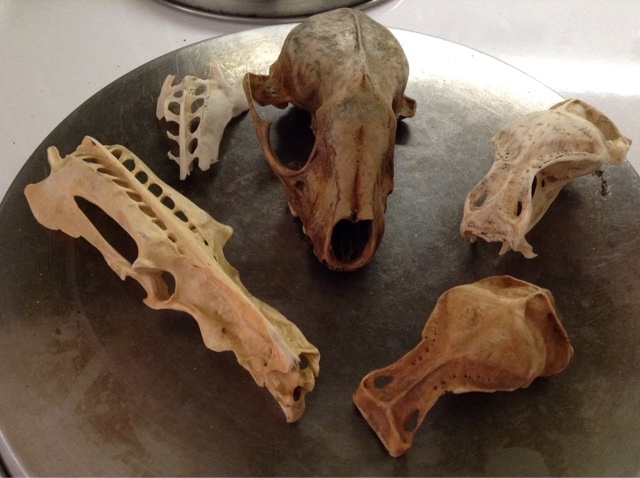 One item collected caused us all to look closely, and think about categories such as nature, and not nature. 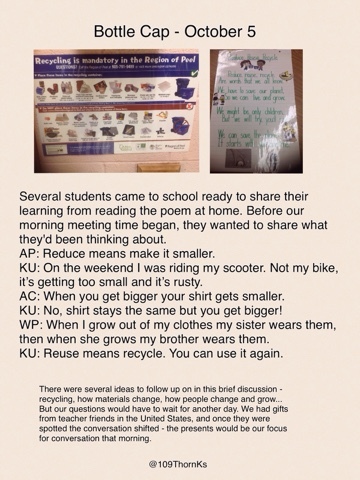 Pooneh showed me after school and we both agreed it would be a fantastic provocation for our next morning discussion. What I captured of that talk is shared below. This is how it began: a bottle cap intrigued us. We wondered how it got in nature. There were so many ideas and questions to explore after our discussion. Play and learn time follows our welcome circle (morning meeting), and students broke off to follow their interests in groups or alone. We had our notes (used to create the collage above) and I wrote "bottle cap" in our day plan under "possible sparks" for the rest of the week. Note: When I started to share the documentation with families I began by numbering the days, but somehow switched in later weeks to using dates. These first few days took place during the 3rd week of school. As well note that most of the collages will show up too small to read in many formats, so click on any to enlarge. The next day, we discussed the bottle cap all together at our welcome circle. We had so many questions and connections! The cap inspired to much thought. Students were talking about our exploration at home with their families, and bringing more questions to the class. We wondered: what is this made of? The request to tweet "Ranger Rob" came up, as it often does in our class - he is one of our favourite resources when it comes to learning about nature. AC's idea, to ask everyone her question: "Nature, or not nature", was well-received by her classmates. 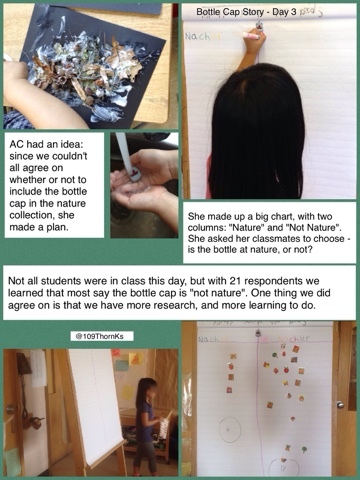 She made up her chart and we all took a turn showing our opinion of the bottle cap. AC's question about the cap showed us that we didn't all agree, that we weren't certain about what the cap was made of and that further study was needed. This reminded Pooneh of another item in our class that had confused someone (we weren't sure whom). It was a toy pear, but she had found it with a very clear bite out of it. 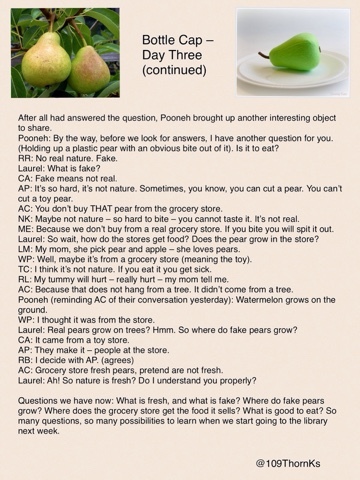 If it wasn't a pear, what exactly was it? Now we were really challenging our categories! A wonderful addition to our classroom conversations came in the form of tweets from other classes that follow our class twitter. 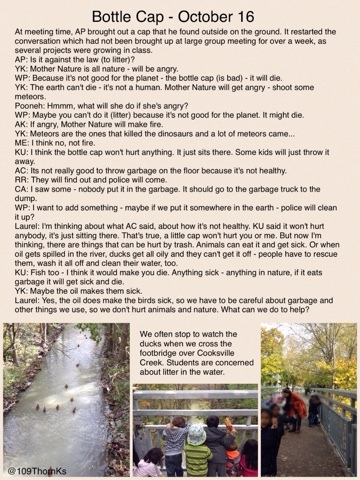 These tweets below lead to more thinking, and we wondered if other classes would begin to question their environment by looking closely, too. @109ThornKs Some Ss said it didn't belong there. What do you think? 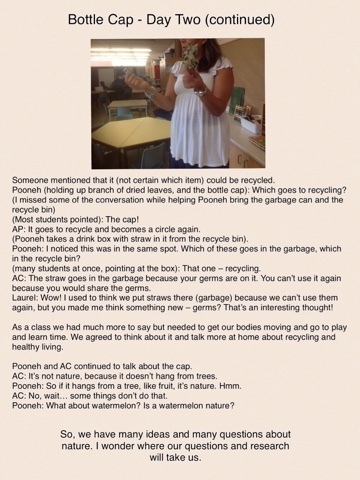 We were thrilled to see that our class conversations were leading to families conversations, too. 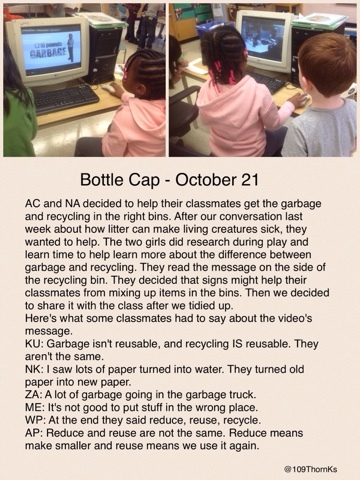 One bottle cap, studied and considered by our class, was creating change! @109ThornKs after talking at home, we decided to send yogurt and applesauce in reusable containers to reduce garbage in WP's lunch. With several other questions and sparks for projects developing in our class, it was a few days before we discussed #capspark all together again. *Note: the date on the page below is wrong, it should read October 2nd. I wrote these documentation pages from my notes, a few weeks afterwards, and must not have flipped the calendar to locate the Friday of that week. 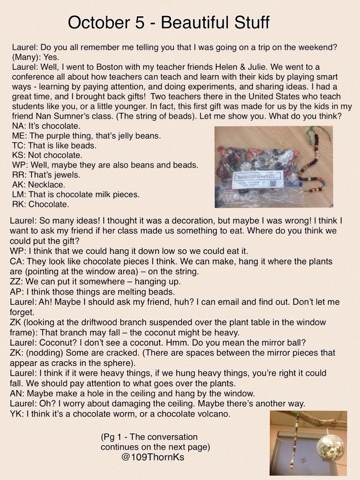 This first weekend in October, I had a whirlwind trip to Boston with two Hawkins-inspired educator friends to attend a conference about learning through play: "Cultivate the scientist in every child: the philosophy of Frances and David Hawkins". It was an amazing weekend that deserves its own post, but it bears mentioning here because it is the reason the documentation took a while to produce, as well the gifts I received from online friends we met face-to-face there added much to the exploration of materials and the ideas about nature and not-nature. 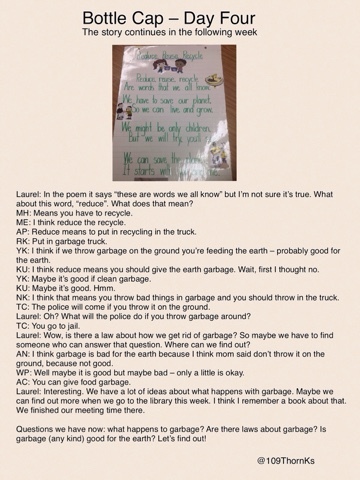 The 3R's poem went home and sparked family conversations, too. Students came back after the weekend bursting with ideas. 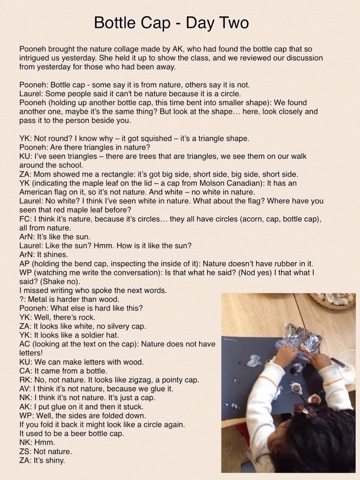 The first page below documents a conversation amongst a few students who came to chat with me rather than explore the discovery bins that begin each day before our welcome circle. We continued to look closely at materials and make connections when we came to morning meeting. I told students I'd had a wonderful time on my trip with Helen and Julie, and brought out the gifts from my new friends Ann and Nan, both teachers in the U.S.A. The conversation continued as we opened and examined the next parcel, the package of "beautiful stuff" from Boston. We examined the gifts briefly, but by now we'd been together at carpet for longer than usual. This new addition to the class, however, meant that our conversation about materials would continue into play and learn time, and become a part of the play. 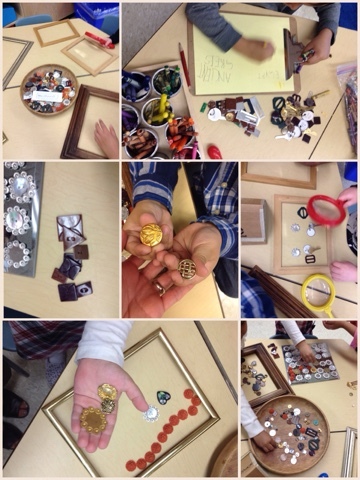 The gifts lead students to make theories, sort, and arrange in various ways, as they looked closely at the details of each piece and found the ones that attracted them. I stayed as long as I was able, and captured the following ideas. It was one of the days I wished I could have left a recording device at the table while I attended students elsewhere around our busy classroom. 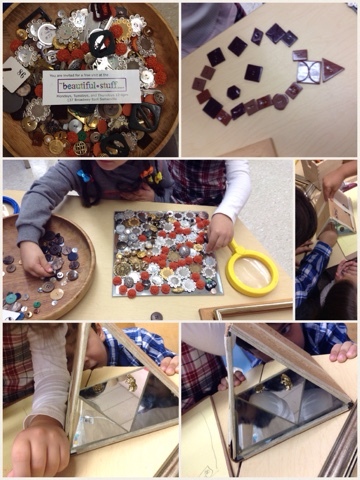 Touching, looking closely, sorting, examining from various angles, creating with the beautiful stuff. While other projects began to grow, the #capspark story continued to make us think deeply about things around us. 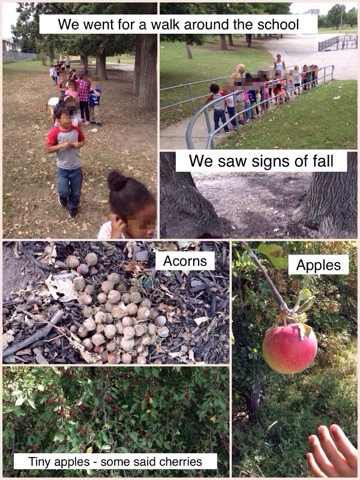 We wondered about nature, about litter, and about health. Projects often grow when a few motivated students take leadership, do research, design and conduct experiments, and teach their peers what they learn along the way. 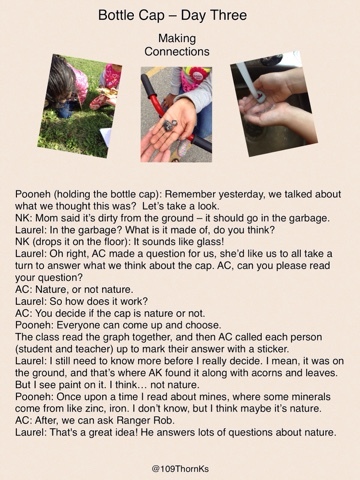 The little bottle cap continued to inspire thinking about materials and our responsibilities as people in the world. We talked about what the news story meant. We agreed that to learn more, we might need to ask an expert. @109ThornKs you can share Legacy's story as an example of re-use: https://t.co/DWMf35OnlX We can do a lot with the stuff we throw away! 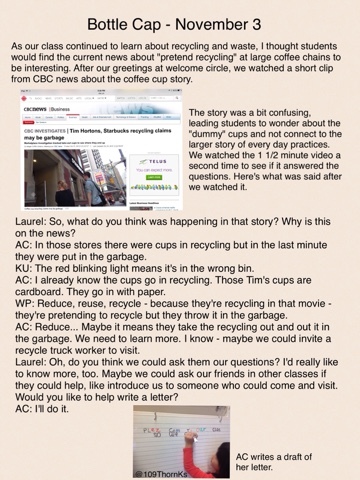 As I revisited this part of the story, I remembered that AC and NA wanted to record their ideas about recycling, to share with the class and with our families. 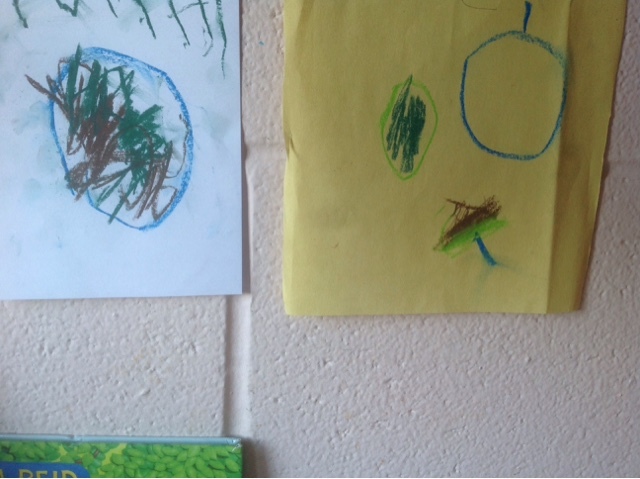 The two students started a digital book, with their drawings and photographs of items in and around our classroom. This book project fell dormant, needing more quiet time for recording their story. I shared a news story (above) in hopes of sparking more interest from others who might help with their book, but as often happens in our emergent curriculum classroom, other interests rise to the foreground and others sink, sometimes for good, sometimes just under the surface awaiting a new spark. The legacy of many projects in our class that come back to how we love our local environment and what it means to be a good steward of nature: we care deeply about our naturalized area, the "no-mow zone". These materials continue to be a part of exploration in class. How that makes sense for me is a post unto itself, but to put it simply here: everything has beauty if you know how to look. Taken as a part of the larger aesthetic, "wabi sabi", kintsugi is a beautiful image for how we create gold: by mending our ideas as old concepts "break" in light of new findings. As we learn, cognitive dissonance may be difficult, or may be treasured as evidence of new wisdom. 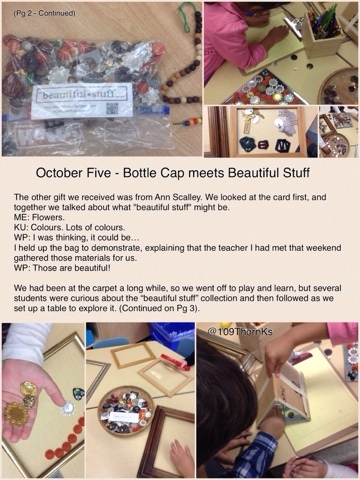 The discarded bottle cap and collection of "beautiful stuff" allowed us to examine what we think about materials, about garbage and "waste", about beauty, and about life. I wonder if you'll wonder along with me... what is beautiful? What is nature? What does it mean to be alive? What does it mean to take care of the earth? What is important to teach children? and many, more more questions.